Happy New Year, Dragon Lords! Let’s start 2019 with a ROAR! This month, we’re featuring a top level and Diamond league player who’s no stranger to the ins and outs of War Dragons. Slaps also had a chance to attend the Dragons Summit last year, so read on for news on the Summit and tips from a pro Dragons player! I started a bit over three years ago. I think it was in September of 2015 when I started and then ended up joining the Dreads in January of 2017. I am currently level 504, on DREADNOUGHT, in Diamond 1. How did you discover War Dragons? Got roped into it on accident by a friend. My friend had mentioned another dragon-related game, so I did a search and was scanning for something that looked close. As I was going through the list, I thought the War Dragons icon looked the closest to the picture he showed me in passing, but I was wrong. I decided to give it a shot and here I am 3 plus years later! Yes, the all-important question of why I didn’t delete the app right away when I knew it wasn’t the correct game. I really enjoyed the dual process of building up the base while also collecting dragons that are used to destroy other bases. The ability to jump in and get a few runs in quickly was also a big draw. My schedule at the time was crazy busy and it was easy to chip away and make progress, initially, without a huge time commitment. That has clearly changed. Dreadnought is one of the most famous Diamond I teams in War Dragons. What’s it like to be a part of such a prestigious group? It has been a blast. The individuals always put the team first and it makes it easy to plug along and be successful as a team. Other teams preach it, but this team does it. And if you don’t get onboard with that then you’ll soon be looking for a new team. It is a solid collection of very loyal and determined individuals that are easy to get along with and interact with on a daily basis. What is the typical communication strategy for officers and members of Dreadnought? Simple answer. Our communication strategy is just listen and do what KINGDREADIV says. If that opinion, or directive, isn’t available then you just do the opposite of what SlaggyNerd says too do. Do that and you get to stick around a long time. How does Dreadnought coordinate for things like PVP Events and Wars? Got any tips on strategy that you can share? Always discuss and get alignment on the plan in advance of the event or war and make sure everyone is aware. The key with coordination is that everyone (good luck) has to be on the same page with the plan. Dread makes sure everyone is aware of the plan in advance and not when it starts or after it has already begun. The strength of Dread, though, is adapting the plan once the event starts and the plan gets thrashed due to event adjustments, other teams stepping up, event errors, etc. That is fluid and changes pretty much every event or war, so not much advice I can give on that note. What is your best advice for lower league teams to advance into the higher leagues? Mostly, it boils down to getting your team organized (as mentioned in my previous answer) and that will carry you the furthest. My experience before Dread was dealing with teams that weren’t organized and that always held us back and caused the most frustration. You have a portion of the team working together and then you have the group that is off doing their own thing and not paying attention. Boot those that are off on their own and not paying attention. You recently attended the War Dragons Summit, a special event with the Dragons team where attendees could discuss all things War Dragons. What was your experience like attending the Summit? A lot of fun. It was great meeting the different team members that manage the game on the PG side, while getting to meet some of the other players that are out there as well. Most of the sessions we had were fairly productive and informative. Only a couple of times did Red get sidetracked on a glitter bender, and I had to leave the room to avoid being decorated. The sessions all went pretty quick with the information that was being sent both ways. I think a couple of the sessions could have been a bit longer for discussion. Still, there were some great sessions and background to issues that are out there that were good to hear. Overall, it was fun to go and be part of the experience. What was your favorite thing you got to experience at the Summit, or members of the Dragons team you had a chance to chat with? Someone say beer fridge? Just kidding, kinda. It was for sure NOT the hotel workers that were on strike and banging on various non-musical instruments all day and all night while we were there. I think that contract got worked out though, so good for them. My favorite part was the art session where Kharnyx presented how they take the dragons from the original design stage through the entire process to get to a final flying product. It was really interesting to see the entire process from start to finish. Let’s chat a bit about your in-game experience! What have been some of your favorite moments in War Dragons so far? Starting off with my favorite Atlas memory, but back then it was just known as Beta. At the time, we were sharing the highest rated land (Eldrios) with NMO. For some reason, they went up and around the map to battle somewhere and left their home castles unprotected. Travel took forever back then, so when you moved to another area, you were committed. They also took the bulk of their team, which left their castles pretty much bare. We moved over and took it all as they raced to get back to protect. By the time they returned, it was way too late, and we already had control of the two castles. The best part, besides getting the castles, was not having to share poachers anymore. I think one of the most entertaining things that Dread gets to deal with is how teams try to beat us in wars or events. Different strategies have been tried and we adapt to counter their plans as the war or event unfolds. One of the most fun ones we had to deal with was when RoyalRoad talked two other teams into joining them in declaring war on us. A fourth team, not linked to that plan, also declared on us that day. I couldn’t tell you the names of the other teams, but it was fun defending all of the banners. In the end, we won ALL of the wars, but it was probably one of the busiest days with war that I have experienced. What was your ‘rise to fame’ in War Dragons? How did you advance up the ranks to be where you are today? It’s a tough question when you think about where the game is now and where it was when I started. I feel like just being able to adapt to the game changes is how I have kept up and not gotten bogged down and burnt out. That has allowed me to consistently advance my account in the game. Each change presents a challenge that you just have to deal with and move on. Others rant and rave on the forums for change, which sometimes works, but most of the time their rants don’t make sense in the big picture. I just keep trucking along and let others get frustrated and bogged down in the forums. I give my opinion when asked, but beyond that I just do what I am told to avoid being kicked for doing something stupid. Eventually, I’d love to have a max base, but just when I seem to catch up, the new tower levels get added. At this point, my plan is to keep up with the dragons and get up to a million troops in Atlas. It is way more fun to go destroy others’ troops, but I’ll figure out a routine to get to a million somehow in the next few months. What is your current favorite event type and why? Currently, it is probably the Temple Raid. It is the newest, so it is still shiny and fun. I also really enjoy using some of the older dragons in the tier-based component of the event. We move through tiers and forget about some of those oldies but goodies that were solid dragons and a lot of fun. Plus you get a few avatars out of the event as well, which I think most people enjoy. When you’re not playing War Dragons, what else do you like to do in your free time? Usually with the family and keeping the kiddo entertained. She doesn’t really care which dragon she flies, but she does prefer the blue spells when she gets the chance to push the buttons. She can’t stand the yellow spells because they don’t do anything. If you could soar through the sky on the back of a single War Dragon, which one would it be and why? Noctua, for sure. I just really liked how you could work through bases with Notcua and the lightning resist was huge at the time. I liked the spell combos and really liked the way he looks with the color combo and texture. A close second would have been Hauheset who I thought I could fly until I joined Dread and they showed me why I was wrong. Lastly, who do you think would win in a battle IRL: Jormungandr, Itzani, or Oni? There can only be one! The winner would be Itzani because hunters are the best. Period. 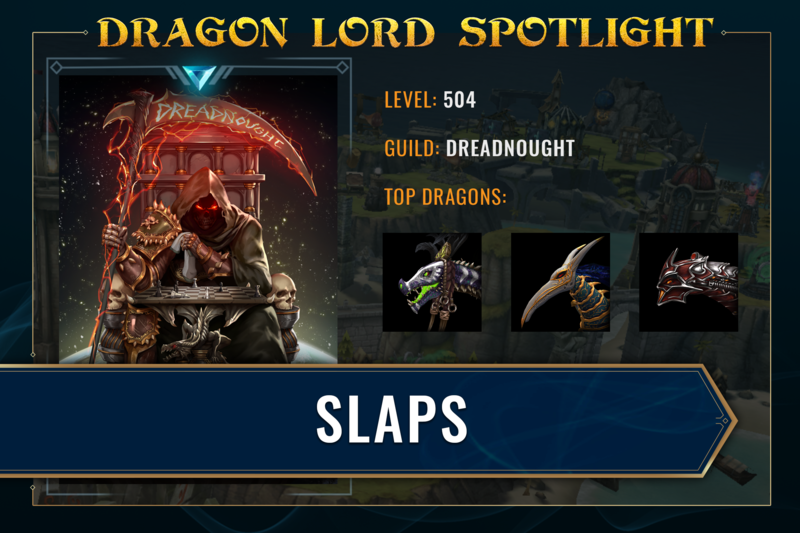 Our Dragon Lord Spotlights feature a stand out player in War Dragons to celebrate their accomplishments and contributions to our community. If you would like to nominate a fellow player for this honor, please let us know by sending us a message on Twitter @wardragonsgame and briefly tell us why you think they would be great to feature!